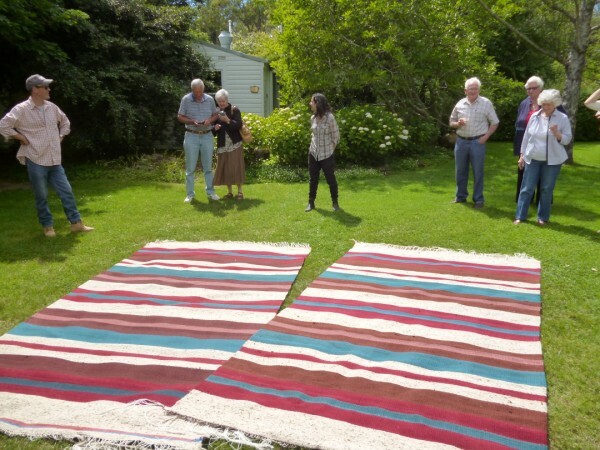 I have held off on writing this post because I wanted it to be about the culmination of The Sturt Community Rug Project. 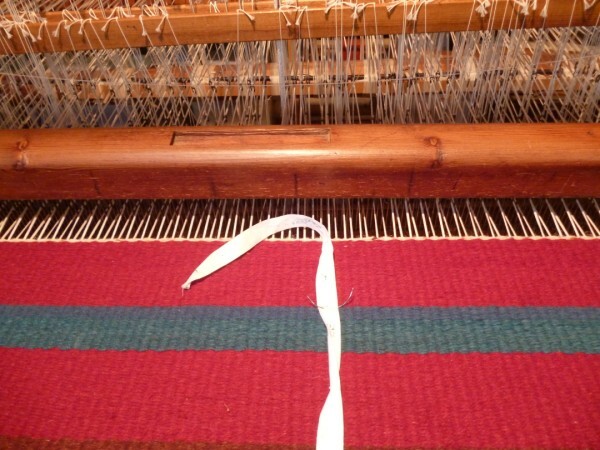 Other things have of course happened in the studio, but the weaving of the two rugs have been such a major undertaking that for this month I’ll focus on just that. 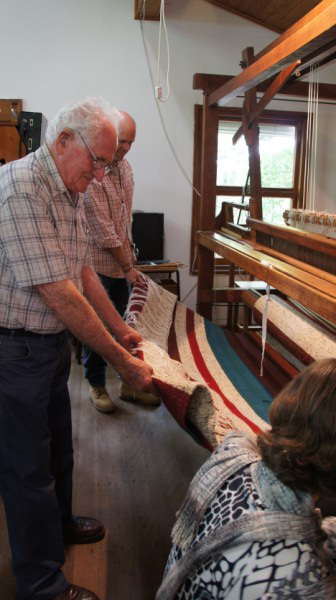 The project is nearly complete with the rugs woven and the ends finished. Minor finishing is yet to be completed. At the start of next term, when everyone returns from break and the space prepared (old carpet has to be lifted) we will have a special installation celebration. It has been the most amazing community project drawing on a wide section of the community. 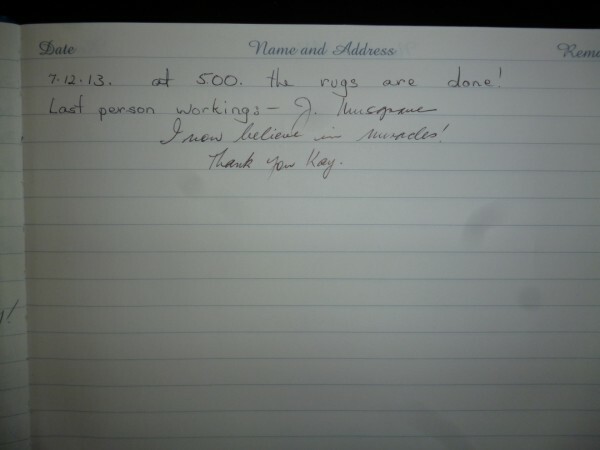 During the project I recorded how much rug was woven and how much was woven each day. All weavers who contributed 30 minutes of their time had their photo taken and wrote in a “participation” book. There was also the option to make a comment. This documentation will be handed over at the celebration. Looking in the book also reminds me of all the wonderful people I have met. There are 76 entries in the book. Most of these are single entries. 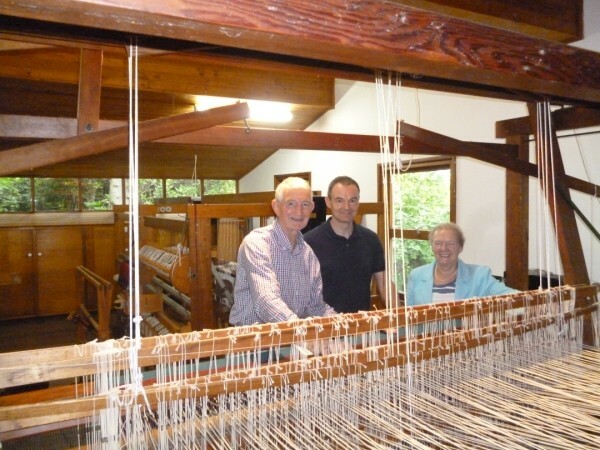 Some people wove twice while three wove four times (Maureen, Mike and Indra). 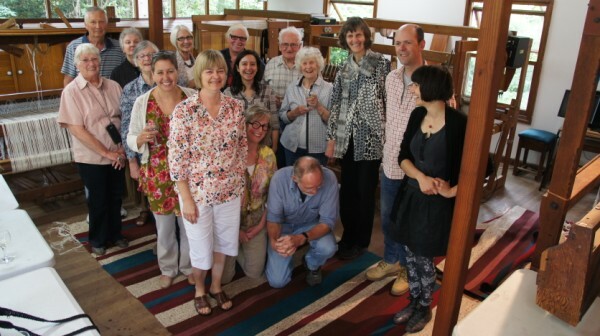 Without all these people this project would not have been finished by the challenging deadline I had made: 2 rugs approximately 2 x 3 metres in just 2 months. The number of entries does not include all those who actually wove on the rug. 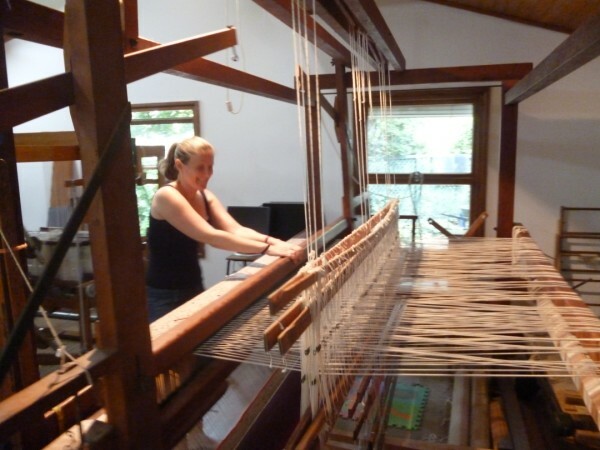 Many days a visitor would pass by and be encouraged to experience weaving and throw one row. The gratitude expressed by these visitors was delightful. In addition, 12 students from year ten spent a block of time in the studio at the end of their year working on a specific project. 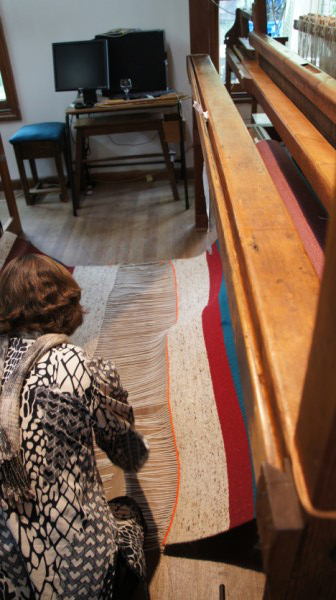 When the project was completed, they were encouraged to weave on the rug. Most did so with some wanting an extended turn. This project has surely touched many more than those listed in the book. The book also allows me to analyse the break- down of who wove. 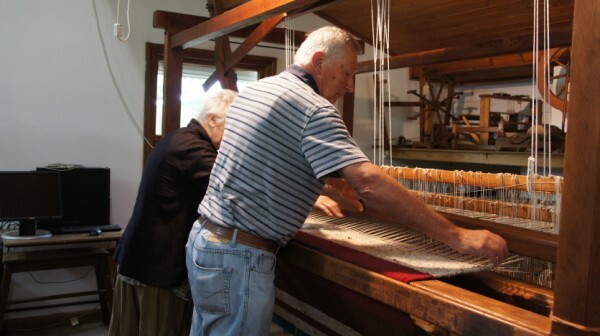 The majority of weavers had never woven before. What a great feat in itself. 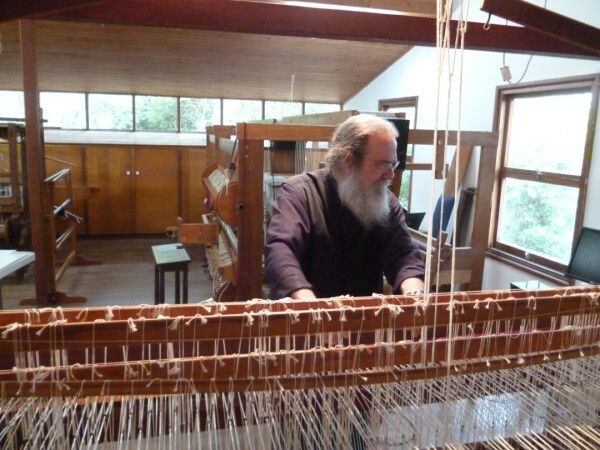 In fact Mike and Indra, two of the 4 times weavers, had never woven before. “This could become addictive” was a familiar comment either verbally or written in the book. There were a number of people who had never been to Sturt before and came because they had heard of the project because a friend had been. 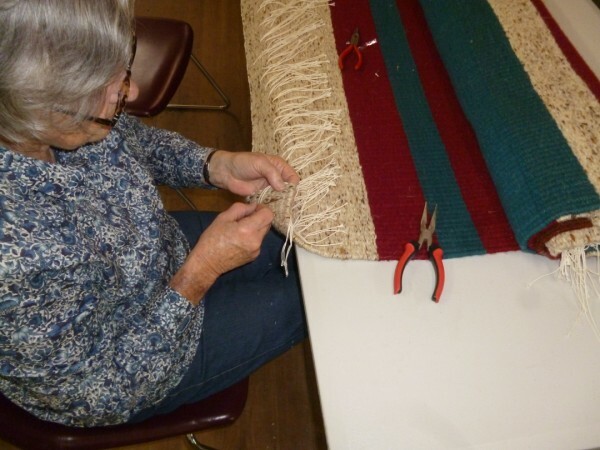 The project was supported by all of the Sturt community: weavers, potters, woodies, people who were there on residencies, office and gallery staff. Friends of Sturt contributed. 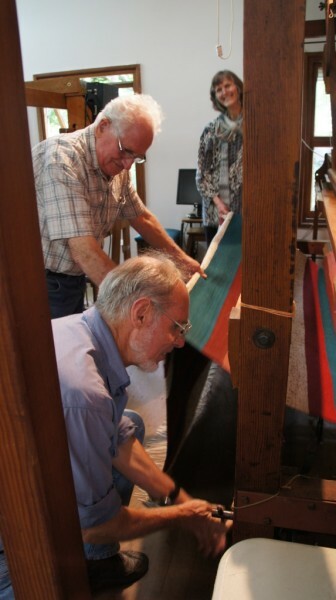 In fact Joan and Julie from Friends of Sturt began the project with a mammoth effort of balling the skeins of dyed wool. Both did so willingly throughout the project. 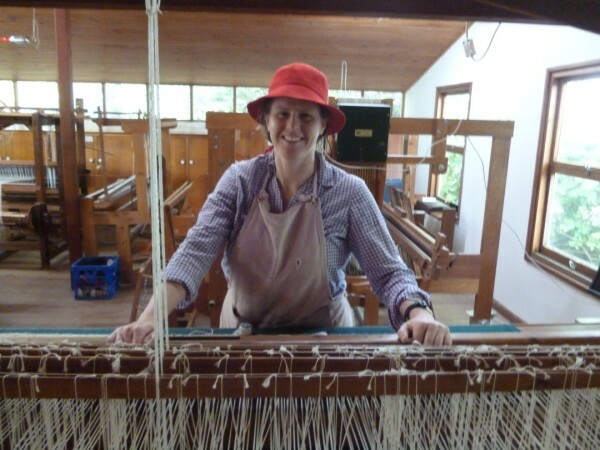 It was entirely fitting that when Julie called by to see if she could help finishing, she was in the right place at the right time to do the very last bit. The comments in the book mean much to me. Overwhelmingly, the most common comment was echoed by that made by fr Kyriakos: “Thank you for letting me be a part of the Sturt Community”. Another common one was “So much fun and a great workout as well! Again! Again!” Helen Cooper. A comment by two visitors who had just arrived from the UK : “A great way to beat jet lag”. And there are just so many individual comments: some that surely make me smile, others that have touched me in other ways. This project just couldn’t have happened without the enthusiasm of those who participated. I’d like to share some images of this last month of the project. A selection of some weavers. There was a special “Cutting Off ” ceremony where all the weavers who had contributed 30 minutes of their time were invited to attend. All names of those there were put in a bucket and the person who had their name drawn had the glory of doing the final row. The second one gets unwound. There was not a big enough space to see the rugs laid out fully side by side. So with due ceremony they were laid out on the lawn. But they aren’t finished yet! The warp ends have to be finished off. Julie does the last bit. The final entry in the book notes the finishing time and date. It has been an amazing effort. You are currently browsing the Kay Faulkner's Blog blog archives for December, 2013.